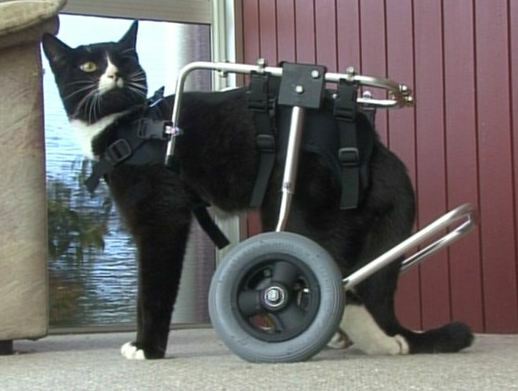 Blacky the Wheelchair Cat has risen over his disabilities, and recently marked the two year anniversary of the accident injured his hind legs. Now he is on a campaign to help raise the profile of special needs pets. On June 10 2010, life changed for New Zealand tuxedo cat Blacky and his Mum Louise Hopkins. Blacky was hit by a car and dragged himself home to his mum. 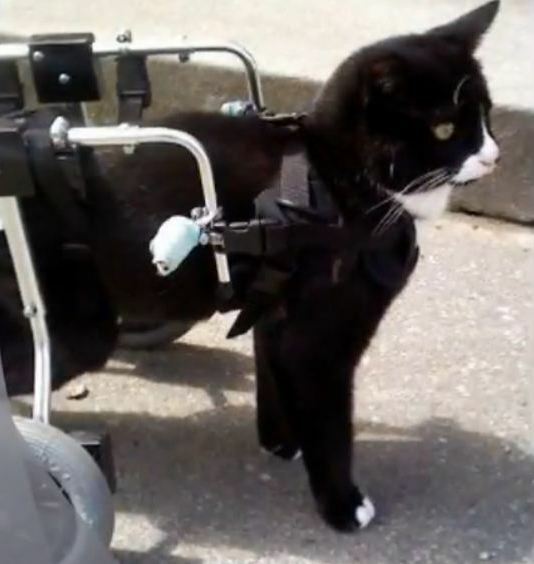 Damage and injury to his hind legs put Blacky into a wheelchair cart. He has some feeling and movement in the legs, but not enough to let him get around. Blacky also lost an eye to an infection. Two years on, Blacky, Louise and Mama cat KC are still together, taking the best from each day that it has to offer. Blacky has received publicity over the past two years, and has an active group page set up and run by Louise, or Lou as she is known, at Facebook. Lou and Blacky’s current project is a campaign to make Blacky the new face of the flea treatment Frontline Plus NZ. Prominent placement on packaging would put Blacky in the position of helping to raise awareness of the adoptability and value of special needs pets. You can vote for Blacky to become the new face of Frontline Plus HERE. Voting closes later this month. Lou welcomes new members to Blacky’s group page Blacky”s followers nz wheelchair cat. This video slideshow celebrates Blacky at his two year anniversary since becoming both a special needs kitty, and an ambassador for other pets like himself. Good work Blacky. Hope you get around in your wheelchair well.